Continuing the ongoing series of interviews with creative artists working on various aspects of movie and TV productions, it is my pleasure to welcome Peter Albrechsten. In what is my first interview on sound design in this series so far, he talks about the language of music and his love of storytelling, creating the sonic identity for his productions, manipulating sound and building his library over the last twenty years, the research he does when he joins a new project, and working with a variety of screening platforms and formats. 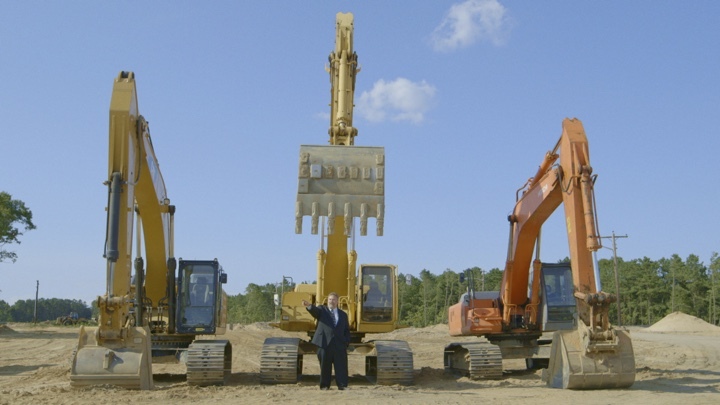 Around these topics and more, Peter dives deep into his work on “The Last Race”, a glimpse into the world of a Long Island stock car racetrack that is clinging to its tradition as the world around it goes through a real estate development boom. Kirill: Please tell us about yourself and what brought you to where you are today. 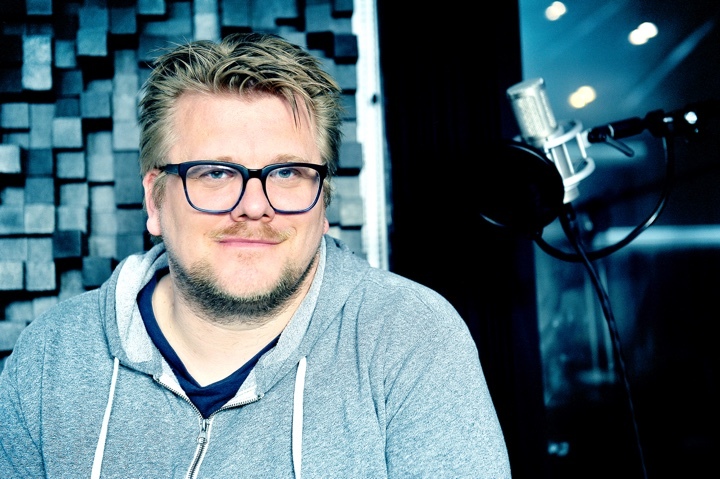 Peter: My name is Peter Albrechtsen and I’m a sound designer based in Copenhagen, Denmark. I graduated from the Danish Film School in 2001, and since then I’ve been working on features and documentaries, both Danish and international productions. I’ve had a great fortune of being part of a creative movie environment in Denmark. I graduated from the film school right when the Dogme movies came out, drawing a lot of international attention. In addition, Danish documentaries have been highly valued over the last 15 years, and it gave me the opportunity to work with a lot of very talented filmmakers. I’ve also been doing a lot of international productions from countries all around the world. I just did a Brazilian feature film, and in the last few years I’ve done films in Israel and Bulgaria. I also do several US indie movies because I know a lot of US film people – in addition to all the Danish and Scandinavian productions. You have a lot of ambitious, very sound oriented creators from around the world who want to play with music and sound – and the visuals, of course. That means that I’m working on a lot of great and ambitious projects, and I’m having a lot of fun with it. Kirill: If I can bring you a little bit earlier in your career, was it always the plan to do sound – when you went to the film school or before that? Peter: As a teenager, I was always into movies and I was always into music. Then I went to the European Film College, which is kind of a pre-film school based in Denmark that is attended by students from all around the world. I think that this language of music that speaks to all of us is the only universal language in many ways. That school was the place where I realized that if you do sound for movies, you could combine all the things I love about music and doing storytelling that I loved as well. So by doing sound for movies I was able to combine those two things. That was 20 years ago, and it feels like I’ve been doing it forever. The amazing thing is that after working with sound for so many years, I can still be surprised and overwhelmed by what sound can do for images. Working on a film and playing around with sounds for it can totally change the perception, the atmosphere and the feeling of it. Doing sounds for a film is an adventure for me. It’s been like that for 20 years now, and I don’t see myself stopping any time soon. 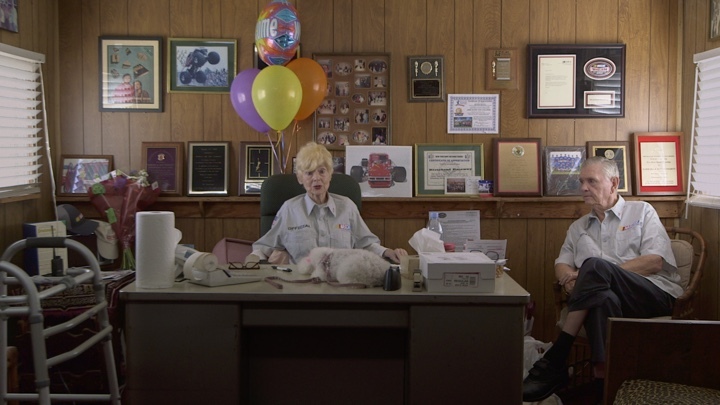 A scene from “The Last Race”, a Magnolia Pictures release. Photo courtesy of Magnolia Pictures. Kirill: When you started working in the industry after school, was there anything particularly surprising or unexpected for you? Peter: I started out assisting on different projects, doing sound effects editing on films such “The Girl with the Dragon Tattoo” and “Antichrist” by Lars von Trier. Those were big, ambitious movies, and I was a part of the sound crew, learning a lot of things from those experiences. Gradually, I started working on movies were I was in charge of the sound. My job now is to try and be the ears of the director. I try to find the sonic language for any film that I do. That happens in via a close collaboration with the director, and I really love the collaborative way of working on movies. You’re doing something that is greater than the sum of the parts. You’re creating something that no one could have created on their own, and I really love that. There could be hundreds or maybe even thousands of people on a film crew, and it’s all about being inspired by the director’s vision. In a way, it’s amazing every time it happens. When someone is building a bridge they can go hundreds of millions of dollars over budget. You don’t see that in the film world. Its effectiveness is quite amazing. The art of making movies is about combining that effectiveness with creativity, and trying to create something special. Sometimes you succeed, and sometimes you don’t. Kirill: Going back to those discussions with your director about the sonic identity of the production, I’d imagine that it’s a bit harder that talking about cinematography or production design. There’s no sketch to draw or a photo collage to assemble to show the visual mood. How do you discuss sound? Peter: It can be difficult to talk about sound. If you look at our language, it has many more words about the visuals than about sound. Often, when you talk about sound, you start making all these different noises of clicks, pops etc. It’s almost like being in a kindergarten. What you need to do is try out things together. I’m involved early on in the process, usually beginning at the script stage. We start talking about examples or ideas. It could be scenes from other movies that I’ve been inspired by. It could be a piece of music that has an interesting sound. It could be a sound effect that inspires us. It could be many things, but it’s really important to get the dialogue going from very early on. It’s hard to talk about sound, so if you only start the dialogue late in the game, then the sound won’t be a true collaborator on the project. It’s going to be an afterthought. It’s going to be about just cleaning up some dialogue and making sure that everyone can understand what’s being said. But the amazing thing is that sound is always emotional. The atmospheric potential that is in sound can be used to full effect if you think about it from the very beginning. 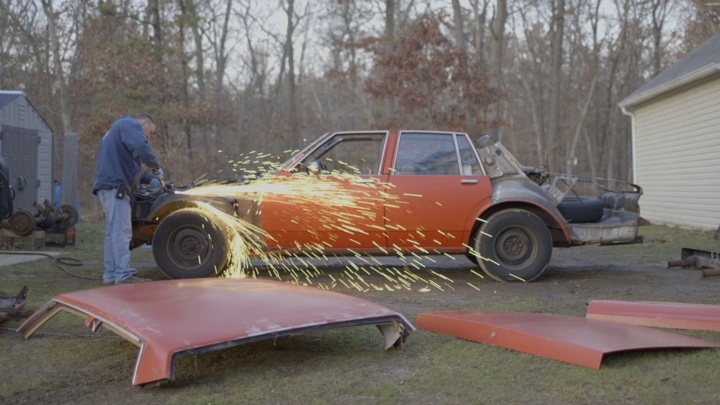 Tommy Walkowiak working on one of his cars in “The Last Race”, a Magnolia Pictures release. Photo courtesy of Magnolia Pictures. Kirill: Would you say that you are involved in all three phases of a production, from pre-production to shooting to post? Peter: I’m not that involved in the shooting, because I don’t go out to record on set. But I am involved in the way that I talk with the team. I watch the dailies to get a feeling of what is this film like. For sure, I try to be a part of pre-production, and then of course there’s post-production. In a way, post-production for me starts sometimes even before the shoot. You need to start finding out how to create the story with sound. I often see the script as a grocery list of sounds that I have to find. If a scene is happening in the ’80s, I need rotary phones and typewriters, for example. For “The Last Race” we needed lots of different sounds of cars. They recorded so many sounds on set, and we recorded and got hold of a lot of other amazing recordings of cars. Gathering material is a creative process that starts early. Kirill: Is there any difference for you when you work on documentaries vs feature films? Peter: In a way, I see documentaries more and more as feature films. The way they work with sound and visuals is quite creative. Back in the old days, documentaries were closer to journalism where you were going out there and interviewing people, and building up the film around that. If you look at “The Last Race”, it’s so abstract, atmospheric and poetic. Very few words are being spoken, and there’s a lot of sound effects. There are as many sound effects in it as you would have in a fiction film. There are layers and layers of sound in there, and for me there’s not much of a difference between the two types of productions. I like saying that for me, the biggest difference between fiction films and documentaries is that in fiction films the actors get paid. It’s about telling stories, and you do that by working with visuals and working with sound, and you can do that in all kinds of possible ways. When you do a documentary, you need to be true to your character or the environment. On “The Last Race” we’ve spent a lot of time getting hold of recordings of nature and the ambiences around the racetrack. We wanted to get the right birds and the right insects, so that you feel that it’s true in a way, and you build on that. I have my toolbox of sounds, and I can do anything afterwards. I try to be faithful, but first and foremost I’m faithful to the story, the characters and the emotions. Kirill: How do you talk about what you do for a living? We are surrounded by sounds in our daily lives, and music is everywhere, to the point that you take it for granted. How difficult is it to convey the complexity of what you do on these productions? Peter: I usually say that sound is the most invisible part of the film. I feel that it could be really hard to describe what I do and what my work is. I tell them that I’m creating this whole sonic world of the film. I’m deciding on how everything should sound, which can be realistic and subtle. I just did a fantasy film and I had to invent the sound of a witch flying. How does it sound when open a dimension to another world? Sometimes you have to invent new sounds. And then in a film like “The Last Race” you have these crazy race cars, and they’re super loud and intense. You need to build your story around these sounds and to find the right sound for the story. There’s a race track sequence where there’s Mozart playing on top of it. I’ve constructed all the race car sounds so that they fit with the music of this Mozart piece. When there’s a big swell in the strings, I could make the sound of a car like crashing into another car. When the cars are skidding around and screeching, I laid it in the same tone as the music so it fits together with it. Doing sound for movies is hard to explain, but it’s such an important part of the story of the film. Barbara and Jim Cromarty in “The Last Race”, a Magnolia Pictures release. Photo courtesy of Magnolia Pictures. Kirill: Do you sometimes get disappointed by the invisibility of it? Peter: I actually like that it’s invisible. You can cheat so much [laughs]. You can manipulate so much. You can use so many tricks. A few years ago I recorded some sounds of hand grenades exploding. I now use a little piece of those explosions to make door slams sound powerful. You would never be able to do that visually because you would definitely notice an explosion cut in. Everyone would notice that. But when you do sound, you can do things like that – and you do it all the time. There’s a lot of manipulation going on, and I find it quite amazing. You have the liberty to be creative with it. At the same time, there’s the practical production angle to it. You need to explain why it’s important to spend all this money on recording sounds. I think that our generation and the younger generations are showing a sensibility for sound, compared to the older generations. I feel like there’s a movement where the audience in the cinemas appreciates great sound. They might not be able to say exactly how something was done, but they really appreciate great sound, and they can tell the difference. I feel like this is kind of development is happening with more and more filmmakers who are very much into sound. Sound plays an important role, and there’s a lot of great filmmakers like Terrence Malick, Martin Scorsese or David Lynch who are also great with sound. That kind of inspiration also means that a lot of new filmmakers are coming up with a lot of unique ideas on how to play around with sound and music. Kirill: You said earlier that you work on a lot of international productions. Do you find that there’s a universal language of sound? Do you try to find sounds that are unique to the local culture? Peter: When I do a movie about a specific area, I always spend some time on finding out how that area sounds. I get local recordings. I go out there to record myself, or I get hold of stuff from that area. I definitely try to have some local flavor on each film. 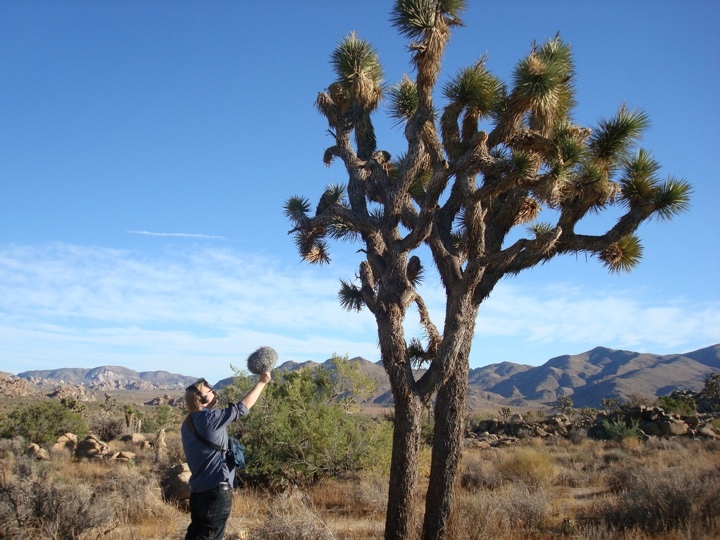 Sound is such a big part of our environment, and sometimes we tend to forget that. You can open the window in your room, and you immediately know if it’s night or day, if it’s a busy day or a quiet day. There are so many things told through sound that you don’t think about generally, but which really have a great influence on your everyday local environment. And at the same time there’s so many great sounds just around it. I always walk around with a small hard-drive recorder and just record sounds. When I go to the supermarket, if there’s a fridge that has a weird sound, I’m standing there recording the fridge. And then my two kids are running away and trying to look like they don’t know me at all [laughs]. I’m always exploring the world of sound, because there are so many great sounds. Kirill: How do you keep track of all of that? Do you have some kind of a system to categorize all these sounds and save them for your future use? Peter: I have an enormous sound library. I have a database where everything is registered. I try to register sounds based on what they actually are – like the sound of a car or thunder, but then I also sometimes try to write down which associations I get with the sound. For example, a noise might be associated with creaking or darkness. Then, when you look for something, suddenly sounds come up that you would never think of using. I’ve mentioned this sound for flying witch that I just did for another film. I was looking for something that wasn’t just the usual kind of whoosh that a lot of magical sounds are associated with. I looked for something that was powerful and noisy, and then I found a recording of my old washing machine. I then pitched that down and gave it some reverb, and then it worked really well for flying witch. I often start out my projects by listening to a lot of sounds and then just putting them in Pro Tools. I might not even quite know what a specific sound is, but it suddenly makes sense when I play around with it together with a visual. Kirill: What was your involvement with “Dunkirk”? Peter: The scope of that production was enormous, and I was a very small part of it – I recorded some boat sounds for the film. I know the sound designer Richard King who worked on it, and he got in touch with me because he needed some specific boat sounds that he couldn’t record in the US. He spent a lot of time recording the actual sounds for everything. He recorded planes, boats, machine guns and explosions, but he couldn’t get hold of this special old boat. It turned out that you could get hold of that boat right here in Denmark. Me and my assistant recorded that boat. We went out there with a long list of things to record, and we got all those sounds that were then used in the film. When you think about it, do you really need to get someone on the other side of the world to go out and record this specific boat for your film? That’s where I really feel that sound makes a difference. You feel that there’s attention brought to every sound. In my opinion, every sound tells a story, and that’s why it’s important to have the right sound for everything. I spend a lot of time on recording sounds for my projects. It was amazing to be a small part of this great movie. The work that the whole sound team did on that film was amazing, so I’m honored to be a tiny part of that. Kirill: Do you have a preference between like smaller productions where you are doing almost everything, and the bigger ones where you have a lot of people doing sound? Peter: I like to combine the two. This is why I go back and forth between doing documentaries and feature films. Feature films usually have big crews, and on documentaries you usually have a smaller group. Both things can be nice, funny and interesting. I like that new projects are quite different. I get to try out different things. I’m trying to do new things for each film and trying to reinvent myself a little bit, so I’m not just doing the same things. When the projects are different, going from a horror movie to a documentary to a fantasy film to a realistic drama, it gives you a variety of challenges. I love that. Kirill: I was watching “The Last Race” the other day, and what I loved about it was that it felt like a feature film that happens to tell a true story. It has a lot of music mixed with a lot of sound effects. How early on did you know the scope of your part on it? Peter: It depends on the production. For this one, all the music was there early on, and I liked that. I liked the variety of classical and modern music. It had a lot of different expressions, and it was fun to work with that. When the music is there early on, I can structure all my sounds around it. I talked about building the car sounds around that Mozart piece to fit together. I love to do that in the movies I work on. I try to make sound and music come together in a way that makes it hard to say when does the sound design end and when does the music begin – or the other way around. We had that in several sequences in “The Last Race” where music and sound are completely integrated. You get this feeling of one big orchestra playing. I like that when the sound and the music come together to create something new. Kirill: I loved the scene where the camera shows the inside of the car racing, and the driver is cursing at somebody who keeps on bumping into him, and it kind of goes in and out between the car sounds and him cursing. I caught myself almost cursing for him, in a way, during the parts when it was cutting him off. Peter: It’s a very subjective film, and we wanted to convey how it feels to be in those cars, how it feels to be a part of that environment. We did a lot of subjective sound design. We take away sounds, and it becomes almost like you’re in the head of the driver. I liked that, because it created the experience of watching the film and being in the middle of the action. You’re not just sitting outside and looking at something that sounds normal. In a way, you’re being a part of it. When the drivers get ear fatigue, you get ear fatigue as well. You’re in the middle of a personal experience. We worked on trying to get this kind of subjective, visceral experience. Kirill: It was a bit unexpected to sit down to watch a movie about car racing and experience a lot a silent sequences. Peter: We worked with silence, but also with subtle sounds. The sounds of cars sometimes become abstract and turn into air, almost. In a way, it’s like wind. And then there are places where the cars are loud and intense. You hear rattling metal, and we put animal screams and small explosions when the cars hit each other. You get this physical experience of being in the car. There are loud and intense moments. And there are beautiful moments, moments that are almost abstract. Hopefully, it feels poetic in a way. Kirill: When you watch a film that you haven’t worked on, do you find yourself thinking about how they made that particular sound effect? Does that take you out of the story? Peter: Somehow I manage to see and hear a film, and really get into the experience of that, but at the same time to also think about how did they create that sound. Just the other day I was watching “First Man” and I really enjoyed this very visceral experience of being inside these rockets. It was an amazing sonic landscape. I was thinking about what kind of sounds were in there. I was really listening, but then at the same time I was also getting into the story and into the characters. I somehow manage to both analyze and experience at the same time, and I’m really happy for that. Otherwise I would lose one of the loves of my life, which is movies. 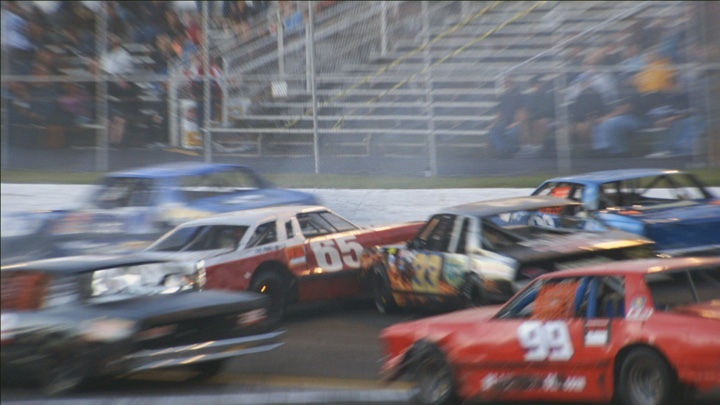 Drivers mid-collision at Riverhead Raceway in “The Last Race”, a Magnolia Pictures release. Photo courtesy of Magnolia Pictures. Kirill: Going back to “The Last Race” for one more question, as you are closely involved during the post-production, do you get to enjoy the final cut when it’s out? Peter: It depends how much has passed between finishing the mix and watching it. If some time has passed, I can experience it as a film and not think about specific sounds. But if the premiere is close to my process, it’s harder. I then get critical of myself. Kirill: How different can the final version of the sonic environment get from what you originally envisioned in your head as you were reading the script? Peter: It’s always a combination. I try to have a vision for how I would like the sound to be in the film. I work with the director, and we talk about how loud or quiet it should be. We talk about how close the mix between music and sound should be. You have all these different aspects, where you start talking early on about how the sound should be. You go through the script and you talk about sound. Sometimes you get pleasantly surprised. You have unpredictable things happening when you work with sounds that just fit amazingly together with an image, and you could never get that idea without trying and playing around. There’s always this mix between having a vision for the project and the wonderful creative accidents happening. The final result is usually a mixture between big visions and happy accidents. Kirill: There are so many screens in our lives, and people can watch movies on these tiny airplane screens, in noisy environments like subway trains, etc. Do you worry about how the sounds you work on are experienced in all these different situations? Peter: When you’re working on a mix for film, you usually do several different kinds. You do one mix for the cinema, one mix for TV, one mix for DVD, one mix for BluRay, maybe one mix for phones. Usually in the cinema you have a great amazing dynamic. You can be very quiet and you can be very loud, and you can’t do it elsewhere. People will start thinking about why did the sound disappear. So you do new mixes for every platform, and it’s quite a lot of work nowadays. There are so many different platforms and so many different formats. You have Dolby Atmos, Dolby 7.1, Dolby 5.1 and Immersive IMAX. You spend a lot of time on the big movies to make sure that it sounds good on all these platforms that you see the movie on. You might spend an extra month just doing mixes for the different platforms. 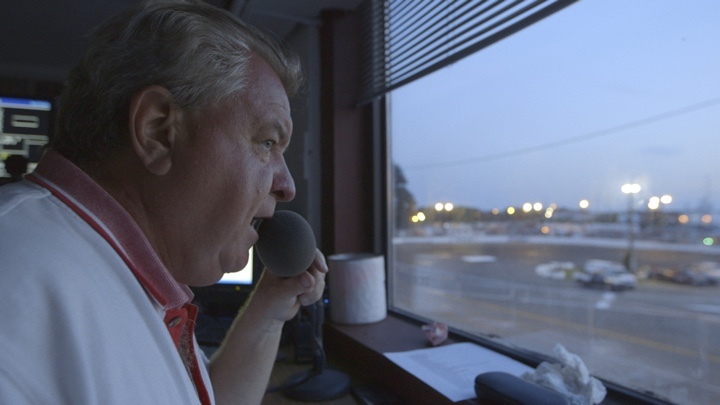 Announcer Bob Finan in “The Last Race”, a Magnolia Pictures release. Photo courtesy of Magnolia Pictures. Kirill: Do you have a setup to emulate all these environments in your studio? Peter: I use a smaller speaker setup for those mixes and then you also check it on an iPad, on a TV, on a bigger screen. It’s quite crazy in a way. You’re sitting there doing a cinema mix, and it’s such a privileged experience. It’s a quiet room and you can control the sound of the whole movie theater. But as soon as people are in their living room watching it on their home setup, you have distractions. There are cars outside, and the air conditioner is noisy, and they get up to go to their kitchen to get some food. It means that it’s not the same kind of focus that you have when you’re in the cinema. Kirill: Are you happy with the state of the software tools at your disposal? Peter: I’m not that much of a technical geek, actually. I find it often boring to talk about technical stuff. I find that sometimes it takes your attention away from the feelings of the sound and what story those sounds are telling. I’m trying not to focus too much on the technique. Of course, there are always some technical aspects which you can spend some time. When I get some kind of new gear, or new equipment or a new plugin, I usually just play around with it. I never really read a manual that says how to do something. I just play around with it and then things happen. I try to do things that way. It’s like being a kid in the candy store, instead of being an old man with a big manual. Kirill: If you had a time machine and you could go back 20 years ago and give advice to younger self, what would it be? Peter: Don’t be afraid. You have all these rules about how to do things in the film business. You have these schedules and traditions of how something should sound that come from classic movies. I really love when you push that a bit and you try new things. I love to make movies that are just a little bit different than what you usually see – or sometimes very different. It takes a lot of bravery and it takes a lot of courage. Doing a movie is such a long process, and it can take a lot of nerve and a special vision. It’s a lot of work and it takes courage to do that. I think that the more brave and the more courageous we are, the more interesting the movies we make are. Kirill: What keeps you going in the field? Peter: I’m amazed by how I can keep on finding new ways of playing around with sound. I feel that sound is such a big part of movies, but there’s still so much left to explore. There are so many things to try out. It feels like an adventure. It feels like you are an explorer playing around with sounds and images. The feeling that you can be surprised and amazed by something you’ve been doing for so many years is really wonderful. 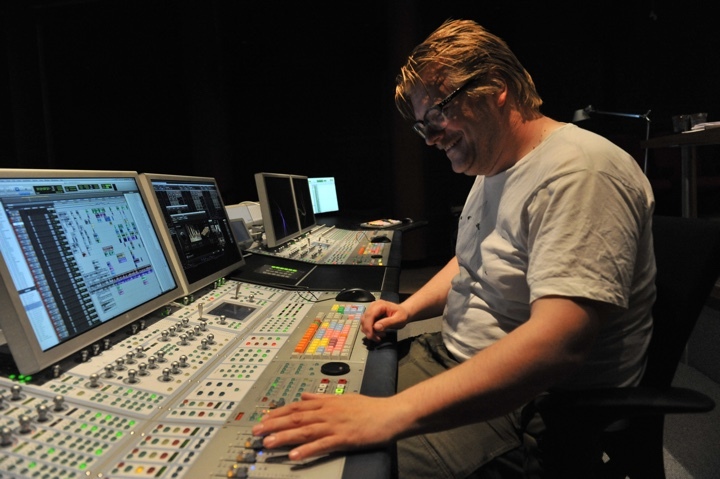 And here I’d like to thank Peter Albrechtsen for finding time in his busy schedule to answer a few questions I had on the art and craft of sound design, and on what went into his work on “The Last Race”. The film is available for pre-order on DVD, and is out on digital formats. I’d also like to thank Katie Dooling of Impact24 PR for making this interview happen. Finally, if you want to know more about how films and TV shows are made, click here for additional in-depth interviews in this series. Stay tuned for more interviews in the near future!